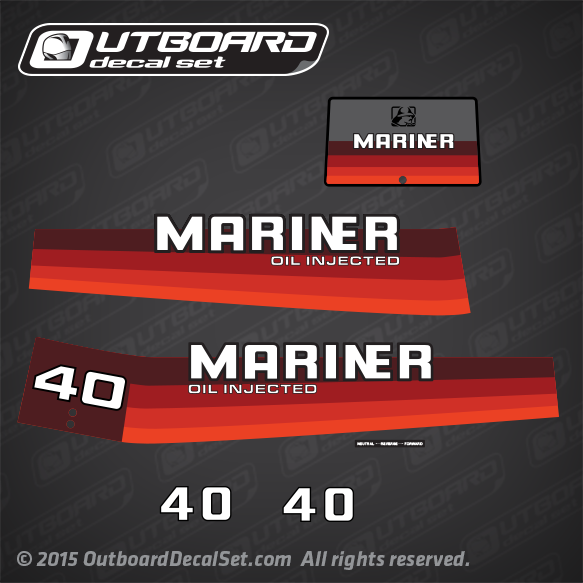 Mariner 40 hp Oil Injected OEM decal set replica for 1982, 1985, 1986, 1987, 1988, 1989, 1990, 1991 and 1992 Mariner Outboard motor covers. 1982 7040202, 7040222, 7040502, 7040522 COWLING. 1985 7040205 , 7040225 , 7040505 , 7040525 COWLING. 1986 7040226, 7040716, 7040206 COWLING. 1987 7040707, 7040717, 7040737 COWLING. 1988 7040201NU, 7040302NU, 7040312NU, 7040416NU, 7040211NU COWLING. 1989 7040201PU, 7040201PW, 7040211PU, 7040302PU, 7040312PU, 7040416PU COWLING.